One of the biggest obstacles I’ve faced in marketing my own company is discovering how many business owners don’t really understand what Marketing can do for them. In order to illustrate the power of marketing, I share examples with them of what good marketing looks like. This particular illustration I’m going to share is one near and dear to my heart because I spent countless hours investigating all aspects of this particular industry back in my industrial manufacturing days. Thirty years ago the standard for a good cup of coffee was Folgers. What is it today? What brand comes to mind? Depending on where you live your answer might vary but for the most part, there is a singular brand which stands out among the rest. Furthermore, we no longer take our coffee with just cream and sugar, rather our java comes in so many delightful options that a trip to your local barista is a challenge for even the most decisive soul. So what exactly happened over the last few decades – what changed? Did Americans wake up one day and demand to pay 400% more than they were used to paying for a cup of Joe? Did our palates instantly transform overnight? Don’t be silly. We were marketed to, over a period of time – it’s that simple. The younger generation, always looking to carve their own path, fully embraced the more European style of coffee which were being offered. They clamored for cappuccino, espresso and latte, not to mention the sugary caramel macchiato, and drinking coffee was no longer “the best part of waking up”, rather it became an “experience”. Can you think of any large coffee chains which might have had a hand in this? Hmm, yes I thought you might! Here’s the part you need to pay attention to if you’re a business owner – if you know your coffee you will know that 100% Arabica beans are far less bitter (and in my opinion the best) and yet, some of the top popular name brands in coffee don’t even use the highest quality coffee beans. Ahh, the power of Marketing! Does that happen in your industry? The person with the best product or the best quality, are they really number one? Sometimes, but more often than not, the answer is no. The company with the best marketing wins. Thus, my question to you . . . Got Marketing? In order to show you just how great marketing starts I want to share with you the power of holding brainstorming and strategy sessions to develop your marketing plan. Whether formal or informal, strategy sessions are critical to the success of your business. You think it’s silly, right? That’s typically how stuffy corporate types think – it’s Ok, we’ve all either been one of those people or have had to resort to those kinds of people. When we’re in that mode we get caught up in the desire to appear to have it all together and we hate admitting we don’t have all the answers. We typically don’t want to schedule something that sounds as fluffy and frivolous as a “brainstorming session”, so how do you overcome this? The solution – call it business strategy or marketing strategy or simply a planning session – it’s all just semantics anyway, but if you make the mistake of putting together your marketing strategy without relying on a tried-and-true practice of brainstorming, you will miss out on the next big thing for your company. How can I be that bold in my statement? Because I’ve seen it over and over again. Without an air of openness or an environment which supports brainstorming and the creative process it means the culture is so internally driven that you will never meet your customer’s expectations, much less exceed them because you aren’t focused on client’s needs – you’re focused on your own. You can’t be internally focused and have successful marketing. So again, I ask . . . Got Marketing? Many moons ago I worked for an appliance controls manufacturer and we manufactured mechanical and electrical controls for appliance manufacturers. I was there when the single cup coffee makers were exploding in the market and many companies were vying to carve out their space in this growing market segment. I spent a great deal of time researching coffee – global consumption, trends, what was happening with coffee producers, as well as the coffee manufacturing processes. In addition, I was studying which coffee producer was in partnership with which coffee-maker manufacture and who was private labeling and who was already selling those single cup or, as they were also known, coffee pods for which coffee-maker manufacturer. The growing demand for coffee and the types of coffee was utterly fascinating. Because this is such a universally understood commodity I thought I would use it to illustrate how good marketing comes about. 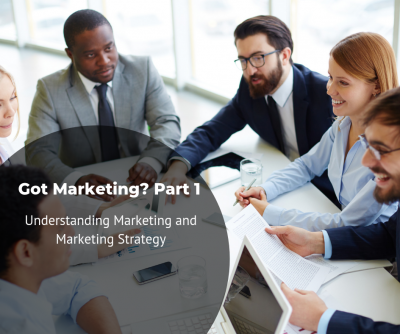 Don’t miss next week’s blog post because in Part II of Got Marketing? You’ll get to be a fly on the wall in a fictitious conference room so you can see for yourself how great ideas start, and how even the smallest brainstorming session can grow into billion dollar ideas.